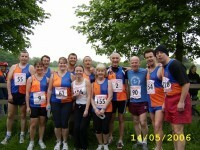 Easter weekend was busy for club runners. Paul and Brian ran in the inaugural Richmond 13.1. Over a multi terrain course covering Road, trail, slippery ice patches and even 3 flights of stairs at the end! Paul took a full 8 minutes off his previous Half Marathon PB even after being off form due to illness whilst Brian took his foot off the gas a little as he prepares for the Virgin London Marathon.